I too became addicted to those tiny little meatballs, as I raised four of my own tiny people in economically difficult times. How to stretch a small amount of meat to feed a family of six and keep it filling, flavorful and interesting. We extended used soy protein, a bit more crumbs, sometimes encaseing a pimento olive inside some of the morsels to create the “surprise” meatball, and a fun contest at the table. The sauce was not elegant starting with a can of mushroom soup and stretching with milk and broth. The basis of this dinner remains today much like yours enchanced with sherry, fresh mushrooms and sour cream tweeked to please the adult but could revert at a moments notice to resourcefullness and “difficult times”. Thanks for the trip down memory lane. Well, I am the one who thanks you for such a wonderful comment, made my day! I’ve never had Swedish meatballs on top of noodles before, on top of mashed potatoes, but never noodles. Sounds yummy! And as for Velveeta, I’m right there with you. It’s what grilled cheese sandwiches were made out of when I was growing up, and it holds a special spot in my heart, gourmet or no. This reminds me of parties I attended years ago. Seems like there were always Swedish meatballs at parties. I’ve never made them though. Love the sour cream sauce. I need to make this! 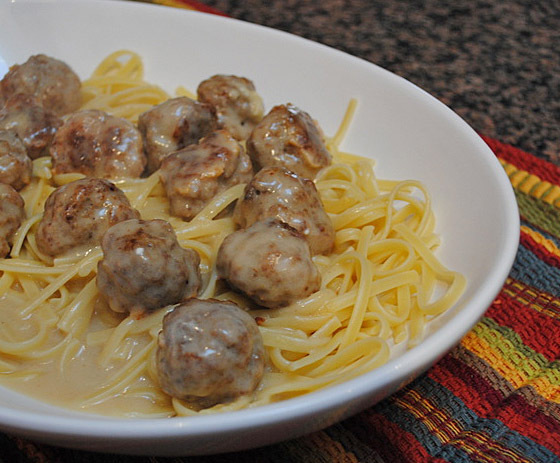 I’ve heard of swedish meatballs as an appetizer dish and attempted it once many years ago. I think I was underimpressed at the rather bland result but it may be time to give it another try based on the lovely pictures you’ve posted especially if it’s as flavourful as the recipe makes it sound. Sally, I’m totally excited to have a real recipe for Swedish meatballs – and especially for the sauce which I’ve never been able to mimic at home (my kids like IKEA Swedish meatballs…) – so I’m going to try and make this for them; I might skip or reduce the sherry in their version but make a separate one for Greg and I with it in ;-). You can probably omit it and increase the beef broth – I am sure your kids will love it, and you and Greg too. Have a great weekend! I love food memories! This is a great post. I also love Swedish Meatballs because it’s a dish my mother made often. Hers had a bit of spice in them but basically it’s the same recipe. Delicious! I can see this basic recipe getting a nice pump from spices – and I should add the original had some fresh parsley at the end, but I didn’t have any and omitted it. This was delicious! I didn’t have the sherry so I substituted with some vodka and made up the rest with broth. It’s a keeper in my family. Thanks Sally! What a great comforting meal! Darnit…the blog platform ate my comment! I’m glad you enjoyed this recipe. It’s one of my favorites and I make it often for my family. My daughter (2 1/2) loves the meatballs. love the swedish take on the meatballs! I cannot quite get it right. this gets me so excited 🙂 to be fair, we all have our weird little freakish food loves. i have a strange soft spot for those lipton sidekicks – i blame my dad. but i think that’s why dishes like this get me so amped up! i love the texture and smell of them and there’s just something so similar to those boxes (or frozen dinners in your case) yet so much better by creating it from scratch. i love this. This sounds great. DO you think I can make it ahead one day and reheat for Christmas. Do you think the gravy will get too thick? Definitely a make-ahead dish, in fact I think it would only get better if you make it one day ahead. If the gravy seems too thick, just thin it out a little with some beef broth. It only took me 5 years to find this, but here I am! This is right up my proverbial alley. SO won’t go near beef broth so I’ll use chicken broth and we both like marsala so will use that instead of sherry. I have half batch of pasta dough in the freezer, may even make my own noodles. Better get on it before it’s too warm for this kin of meal. WOW, you really got this one out of the darkness of the past! How cool is that? I might have to re=visit this recipe too….